Aishling and Conor like to hike. 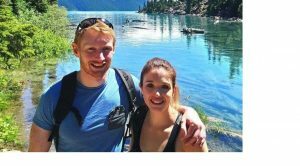 They only met four years ago but by the time they come back from their honeymoon, in 2020, they just may have clocked up over 28,000 miles together. Visiting three continents – America, Europe and Asia – and hiking in the mountains on each of them. That’s the equivalent of going around the world and back and then some. And, of course, they got engaged along the way. When they got together they discovered that they both loved hiking. When they could they would head off to Connemara to spend the day walking in the Maumturk Mountains or the Twelve Bens. They wanted ‘to do the whole year abroad thing,’ Aishling says. So after Galway they went to British Columbia in Canada. Swapping the Atlantic for the Pacific, they based themselves in Vancouver near Stanley Park overlooking English Bay. To help pay for the trip, Conor worked as a civil engineer while Aishling worked in North Face, the outdoor clothing store. They hiked in the national parks in Jasper and Banff and hiked up into the mountains. ‘The whole outdoors thing was the draw,’ Conor says. 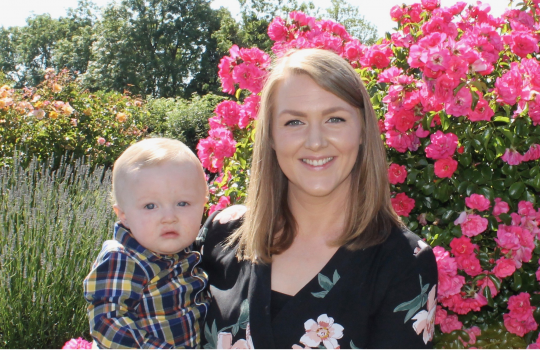 After their year in Canada, Aishling and Conor came back to Ireland and now live together in Athlone. 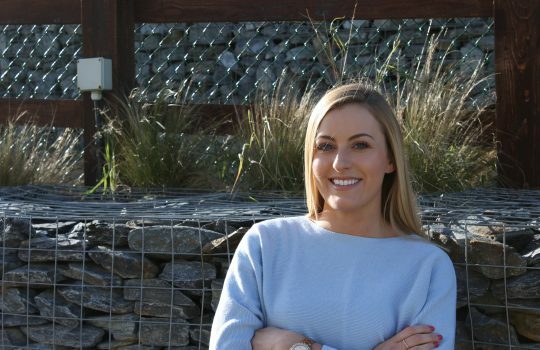 Conor is back working with the same oil and gas company in Galway while Aishling works locally in a pharmaceutical company. But their experience abroad has increased their love for hiking and for Ireland. ‘If anything, it’s become even more of a passion since visiting Canada so now we’re trying to see all parts of Ireland,’ Conor admits. 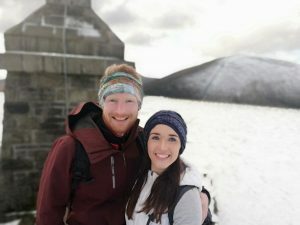 The couple took on the challenge to climb the highest peaks in every county in Ireland by the end of 2019. ‘You know when you go abroad and people ask you about your own country and you haven’t seen certain parts of it?’ Conor asks. The couple hope to put that right. They have already climbed 19 peaks in a year. ‘Then there’s a very impressive one called Slieve Donard (850m) in County Down, it’s pretty amazing,’ Conor says. But the best one so far? ‘The 12 Bens in Connemara. On that day, we climbed 4 different peaks over a 7-hour hike.’ Benbaun, the tallest peak, is 729m high and the highest mountain in Co. Galway. The couple have, in their own words, ‘been seriously lucky with every mountain top’. They have had clear weather when climbing 18 of the 19 peaks so far. ‘I had a pretty good inkling that would be the spot before we got there,’ Conor says of the place they booked in Croatia last year. There was a lime tree growing beside the balcony of their apartment which overlooked a private beach and the Adriatic. When Aishling was out on the balcony, one day, she turned around to find Conor down on one knee. The couple haven’t decided on their honeymoon destination yet but it’ll come as no surprise that they’re thinking about an adventure holiday in South-East Asia or Oceania. ‘We’re looking for something different, something that you wouldn’t ordinarily do. An adventure holiday for a week or two then a few days afterwards to relax,’ Conor says. Although it’s hard to imagine Aishling and Conor resisting a hike for too long. Bank of Ireland offers a range of deposit and savings accounts. To find out more about a Bank of Ireland Goalsaver click here. Terms and conditions apply. Over 18’s only.